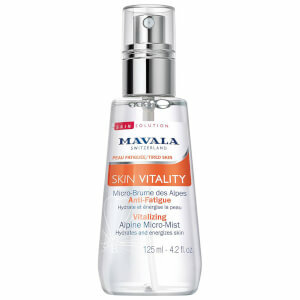 Refresh and reawaken your skin with Mavala's Skin Vitality Vitalizing Alpine Micro Mist, a hydrating facial mist that delivers a veil of moisture onto skin to help wake up tired, lack lustre complexions. 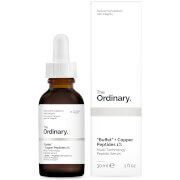 Perfect for perking up skin when signs of fatigue set in, use it first thing in the morning as an invigorating wake up, or spritz over face at any time of the day as a refreshing pick-me-up. Hydrating, softening and energising, the ultra-fine spray contains decongesting Cornflower Water, and Swiss Apricot extract to help tone and exfoliate whilst delivering antioxidant benefits. 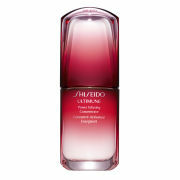 Skin appears immediately glowing and feels replenished and well-rested. Can be used before makeup application, or for setting makeup in place. Delicately scented. Gas free spray. Spray on face before day care routine, and all day long at the first signs of fatigue. Leave to penetrate. In case of extreme tiredness or during mask application, generously soak two cotton pads. Place one on each closed eye and leave on 2 minutes for a fresher, rested look. Tip: For an even more spectacular effect, you may keep the product in the refrigerator before use. Water (Aqua), Isopentyldiol, Glycerin, Malus Domestica Fruit Water, Centaurea Cyanus Flower Extract, Prunus Armeniaca (Apricot) Fruit Extract, Malva Sylvestris (Mallow) Flower Extract, Aloe Barbadensis Leaf Extract, Cetrimonium Bromide, Citric Acid, Disodium EDTA, Maltodextrin, PEG-40 Hydrogenated Castor Oil, PPG-26-Buteth-26, Sodium Hydroxide, Alcohol, Fragrance (Parfum), Sodium Benzoate, Sodium Methylparaben, Sodium Propylparaben. [F536/1].